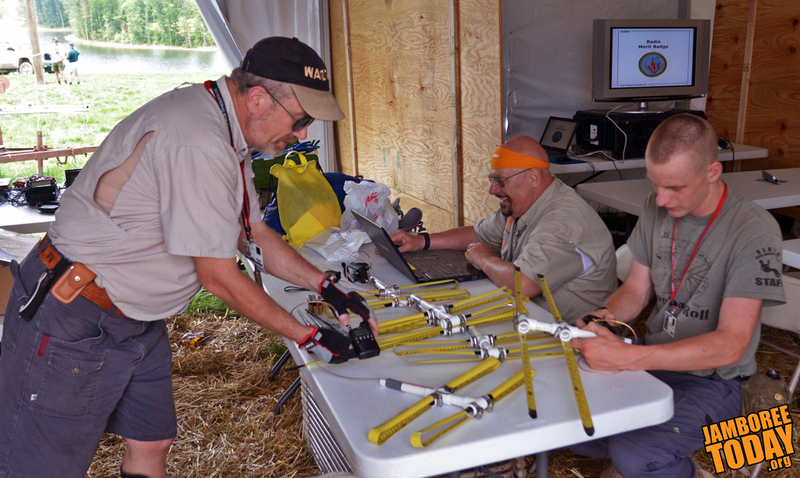 In radio-foxhunting, Scouts and Venturer will use these handheld antennas to track and find a transmitter hidden somewhere at Summit Bechtel Reserve. BSA photo by Greg Luer. Foxhunting, an activity hosted by K2BSA, the jamboree's amateur radio call sign. In foxhunting, participants use ham radios with handheld antennas to hunt for small radio transmitters hidden around Summit Center. “We have six radio receivers with simple antennas made out of PVC pipe and cut up tape measures,” says Kaiser. Competitions are timed. Scouts and Venturers have 30 minutes to find one or 45 minutes to find all five "foxes." Leader boards are posted daily on the K2BSA Facebook page, at www.facebook.com/K2BSA. Foxhunting is very popular in Europe and Asia but is only now gaining popularity in the United States. “There have been 21 teams so far, with 52 Scouts participating,” Kaiser says. All Scouts and Venturers are invited to try their own skills at foxhunting.